This exquisite ladies' bracelet watch will add class to any outfit. Styled with a gold tone dial, this sleek gold plated timepiece is adorned with sparkling crystals for a truly luxurious feel. 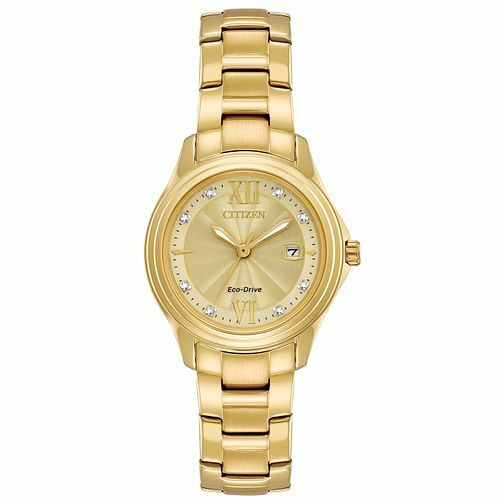 Citizen Ladies' Gold Plated Bracelet Watch is rated 5.0 out of 5 by 1. Rated 5 out of 5 by Anonymous from Great watch I brought this watch for my wife’s 50th Birthday and she love the watch. Looks great on and very comfortable to wear. Would highly recommend it.